Within the heart of Preston Capes is a curious building that resembles a small red brick castle. This ‘eyecatcher’ was commissioned by Lady Knightley of Fawsley Hall during the 18th Century. Behind the facade are two cottages (originally 4) with an archway in between them. 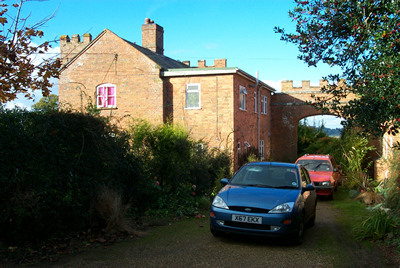 The attractive front, complete with its line of battlements can be viewed from the churchyard of St Peter and St Paul. Over the years these cottages have changed and been adapted for modern living. 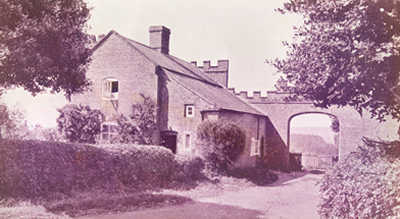 When they were first built each side of the archway comprised 2 cottages. These tiny dwellings consisted of a scullery, one large room downstairs, one equally large room upstairs and an attic room under the catslide roof above the scullery. The stair cases for both dwellings in each of the pairs were located inside the turrets. The coal shed for the cottage on the left side of the arch still has traces of the demolished outside privy on its back wall and is romantically draped with greenery.